© 2017 Corsalini et al. Oral rehabilitation with overdenture on implants of upper jaw must be taken into consideration a variety of anatomical and biomechanical issues. 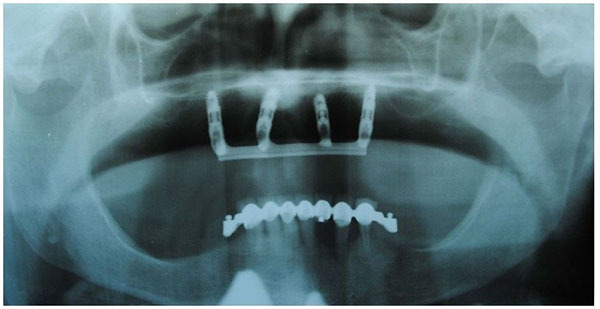 It is possible to provide for rehabilitation with two or more implants, in different positions, solidarizing them with a bar. The present study involved a patient rehabilitated with 4 Xive implants (Friadent GmbH, Mannheim, Germany) solidarized with a titanium bar crafted with CAD-CAM technology for maximal comfort, precision and structural lightness. The follow-up was 54 months, with an implant survival of 100%. Based on our clinical evidence, bars engineered with CAD-CAM technology are promising in terms of precision and comfort despite higher costs. Keywords: CAD-CAM bar, Overdenture, Prosthetic rehabilitation, Implant rehabilitation, Upper jaw. According to the definition of Glossary of Prosthodontic Terms , “overdenture” is a removable, partial or total, prosthesis supported by one or more residual teeth, roots or implants . Cast metal bars have been used in implant supported overdentures as a solution to increase the strength of an acrylic prosthesis and equally distribute load barring forces across the implants. 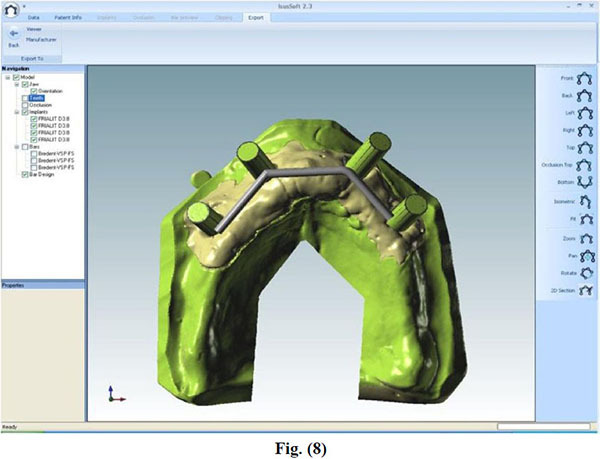 However, the traditional bar for either an overdenture or fixed denture uses cast high noble metal alloys, and because of the increasing cost of gold, complex and time consuming laboratory procedures, commercial laboratories are starting to use the CAD-CAM technology to create the prosthetic framework. Advances in CAD-CAM technology have brought about production techniques, that are faster and more precise, increasing the efficiency in which implant bars are fabricated, and greatly improving predictability upon seating. Although implant supported overdentures are widely considered an appropriate therapy for edentulous patients, late implant failures have been reported , and the most frequent cause is the biomechanical overload of the implants that deteriorates the attachment system . 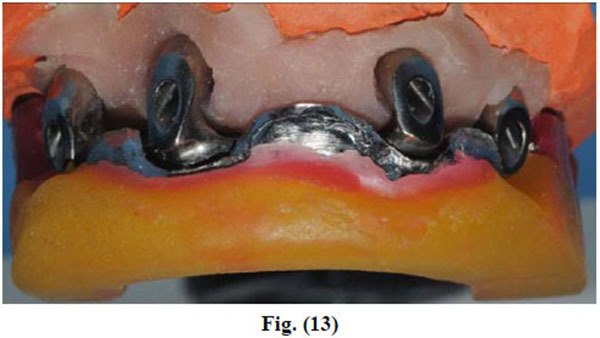 The bar design in itself is biomechanically advantageous [7, 8], and it could increase the success rate of an implant supported prosthesis, especially for maxillary edentulous patients: An implant supported maxillary denture on at least 4 implants and provided with a bar anchorage is a proper treatment option for the edentulous maxilla. Disadvantages of the bar system were also reported, and these were mainly hygiene-related complications due to the difficulty in cleaning the peri-implant zone . The aim of the present study is the critical re-assessment of implant-prosthetic treatment plans in patients with total maxillary edentulia. The clinical success criteria of the present study comprise [3, 10] optimal aesthetic integration of the prosthetic rehabilitation in the smile exposure and the impact of the frontal group in the facial context; prosthetic retentivity and stability; reinstatement of the masticatory function; easy access to home oral hygiene manoeuvres. A patient 73 years old, female, with maxillary edentulism since three years with significant bone resorption was selected (Fig. 1), the patient described in the case report has given informed consent for the case report to be published. The patient did not smoke, wasn’t under radiation therapy of head or neck, intravenous bisphosphonate therapy, allergic to restorative materials used. Fig. (1). OPT of the selected patient. In the present study Xive® S (Friadent GmbH, Mannheim, Germany) implants were placed with minimal length of 9, 5 mm and maximal length of 11 mm, diameters of 3.8 mm, with cylindrical geometry. Four implants, in just one surgical time and with guided surgery, using a surgical template obtained from a scan with denture in place in patient’s mouth , were positioned in the patient: the two distal implants were located in 1.5-2.5 spots, the two central implants in 1.2-2.2 spots (Fig. 2) . Regarding the importance of symmetry of anchorages, the ideal situation is represented by the presence of two pillars in the canine zones and other two in the pre-molar zones since it enables the realization of a support polygon also avoiding the overdenture rotation axis [3, 10]. Furthermore, great care was given to the control of the axis parallelism. The insertion torque was at least 35 Ncm. After the osteointegration, healing and maturation of tissues completed after six months (Fig. 3), we proceeded to the collection of dental print using a polyeter Fig. (4) (Impregum DuoSoft H, 3M ESPE, MN, USA). Fig. (3). Healing and maturation of tissues completed after six months. Once the model was crafted, the technician realized a bar in chalk (Fig. 5): It was screwed together with the stumps directly in the mouth; the absence of fractures is considered a positive result. The precision of the master model was then assessed, it being of fundamental importance as to obtain the passivity of the future structure. Starting from the master model, the technician made a wax base plate (Fig. 6): An intraoral test was performed so as to verify the vertical dimension, the parallelism in respect to the Camper plan and the bi-pupillary line. Fig. (4). Dental print using a polyeter. Fig. (5). Bar in chalk. Fig. (6). Wax base plate. The technician then performed the teeth mounting test. Once the master model and the wax base were made by means of the teeth mounting test, the data of the models were collected with a dedicated scanner by COMPARTIS ISUS® (Manufacturing Center, E.S. Healthcare N.V. Research Campus 10, 3500 Hasselt, Belgium) and a virtual object was then elaborated in 3D (CAD) . After processing, the files were forwarded through electronic transmission to the production plant for the CAM milling of the object according to industrial quality standards (Figs. 7-10). Fig. (7-9) Electronic transmission to the production plant for the CAM milling of the object. Fig. (10). The main connector realized. 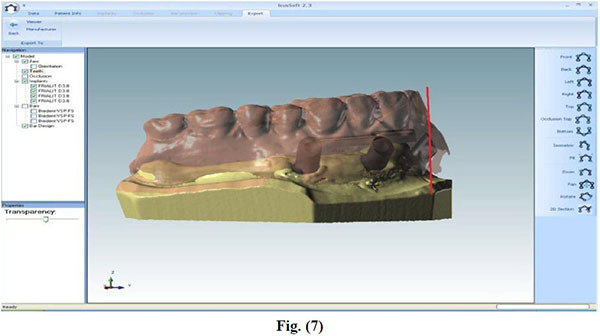 The CAD-CAM system used was COMPARTIS ISUS® (Manufacturing Center, E.S. Healthcare N.V. Research Campus 10, 3500 Hasselt, Belgium). The intraoral test of the main connector was then performed in order to test the fitting with the bar (Fig. 11). Fig. (11). Intraoral test of the main connector. 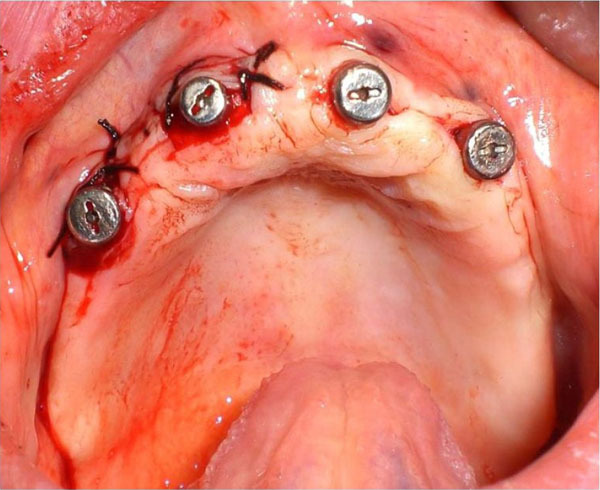 Maxillary implant overdentures with at least 4 splinted implants experienced high implant and prosthetic survival rates [10, 13]; furthermore there was an increased risk of implant loss when 4 or minus implants and non splinted implants were used . In the present study the implant survival was 100% after 54 months (Fig. 16). It should be considered that this is a short follow up time but the implant supported rehabilitation has been realized in a patient with severe bone atrophy. Moreover, we achieved a high comfort for the patient thanks to the significant stability of the overdenture and the absence of the prosthetic palate (Figs. 12-15). Patient satisfaction with function and esthetics was assessed by using a scale with ratings 1-10 with 10 = fully satisfied and 1 = not satisfied . Fig. (12-15) Phases of prosthesis realization. Fig. (16). Implant survival after 54 months. 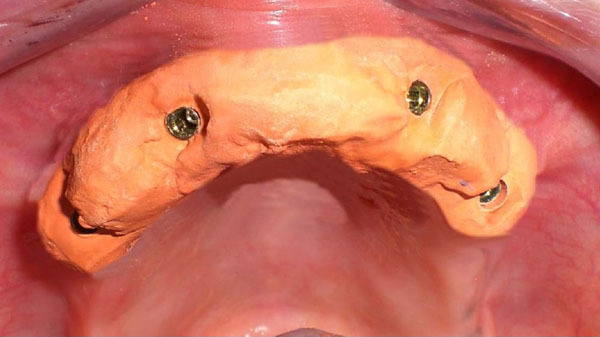 Points in favour of the choice of a removable implant support prosthesis are: Simplified, aesthetically profitable rehabilitation even of crests undergoing resorption (it allows to avoid GBR); favourable premises for correct phonetics; compared to mixed-support overdentures bar-sustained overdentures do not display laying nor dislocation and compression of mucosa, minimising the effects of bone resorption typical of removable rehabilitations [3, 10, 15-17]. 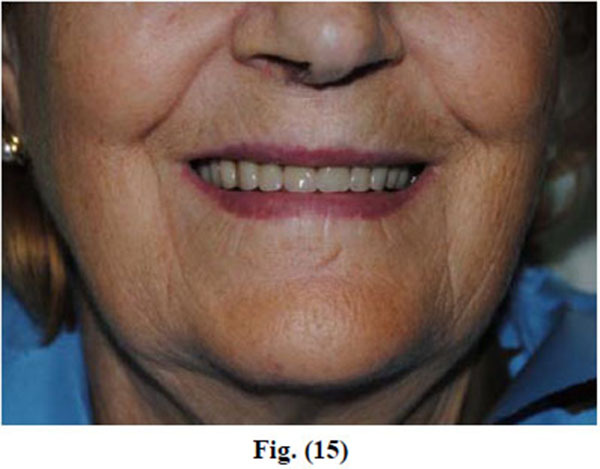 The use of a bar-sustained overdenture compared to a fixed rehabilitation gives some advantages: a predictable management of the aesthetics; easier home hygiene [18-20]; the total implant support reduces the resorption of the bone crest; avoidance of the resin palate from the prosthetic design granting a higher comfort. In our patient we used a CAD-CAM titanium bar  that give us many advantages: tension-less fit; system usable with all implant interfaces; positioning of the structure on implant level (which can be screwed directly to the internal connections of implants) or on abutment; use of only one metal (pure titanium grade 2) ; less time consumption and laboratory work; micrometric precision: the producer guarantees discrepancies below 20 μm on the vertical axis, and below 30 μm on the horizontal axis. The technical reasons for the choice of a CAD-CAM milled bar compared to a bar engineered with conventional techniques are: Solidity  (realization from a sole piece and absence of welding); precision  (absence of misfit and subsequent passivization at the tightening of the connection screws, and absence of stress on implants and bone-implant interface); lightness (low specific weight of titanium) and possibility to directly insert the milled bar into the internal connection implant. The glossary of prosthodontic terms. J Prosthet Dent 2005; 94(1): 10-92. Visser A, Raghoebar GM, Meijer HJ, Batenburg RH, Vissink A. Mandibular overdentures supported by two or four endosseous implants. A 5-year prospective study. Clin Oral Implants Res 2005; 16(1): 19-25. Pozzi A, Tallarico M, Moy PK. Four-implant overdenture fully supported by a CAD-CAM titanium bar: A single-cohort prospective 1-year preliminary study. J Prosthet Dent 2016; 116(4): 516-23. Balaguer J, Ata-Ali J, Peñarrocha-Oltra D, García B, Peñarrocha-Diago M. Long-term survival rates of implants supporting overdentures. J Oral Implantol 2015; 41(2): 173-7. Esposito M, Hirsch JM, Lekholm U, Thomsen P. Biological factors contributing to failures of osseointegrated oral implants. (II). Etiopathogenesis. Eur J Oral Sci 1998; 106(3): 721-64. 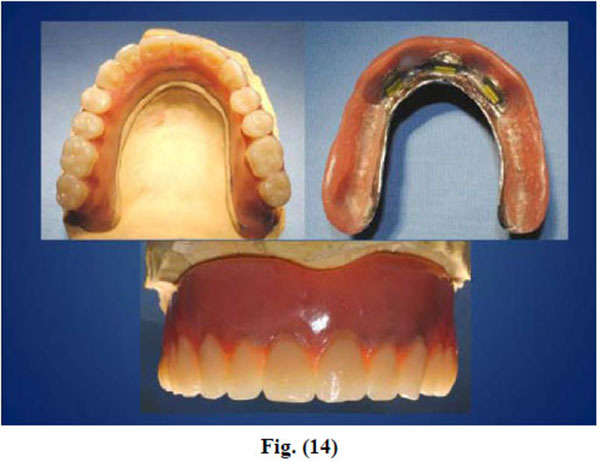 Watson CJ, Tinsley D, Sharma S. Implant complications and failures: the complete overdenture. Dent Update 2001; 28(5): 234-8. Slot W, Raghoebar GM, Vissink A, Huddleston Slater JJ, Meijer HJ. A systematic review of implant-supported maxillary overdentures after a mean observation period of at least 1 year. J Clin Periodontol 2010; 37(1): 98-110. Vecchiatini R, Mobilio N, Barbin D, Catapano S, Calura G. Milled bar-supported implant overdenture after mandibular resection: A case report. J Oral Implantol 2014; 34(5): 216-20. 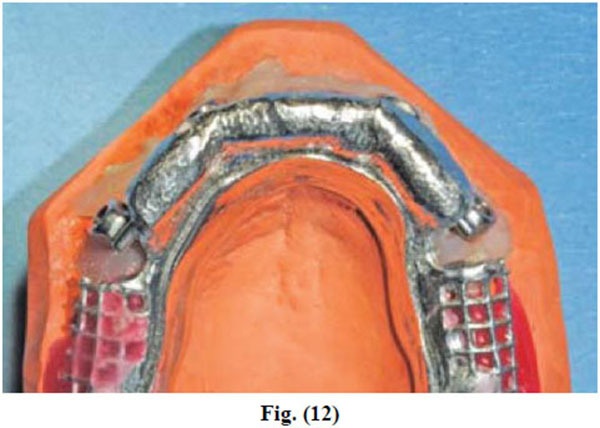 Karabuda C, Yaltirik M, Bayraktar M. A clinical comparison of prosthetic complications of implant-supported overdentures with different attachment systems. Implant Dent 2008; 17(1): 74-81. 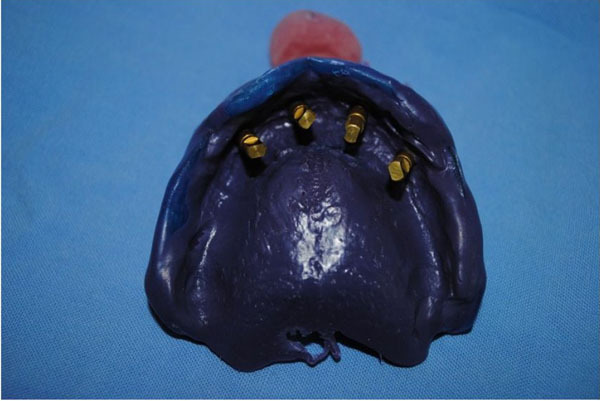 Maló P, Rangert B, Nobre M. All-on-4 immediate-function concept with Brånemark System implants for completely edentulous maxillae: A 1-year retrospective clinical study. Clin Implant Dent Relat Res 2005; 7(Suppl. 1): S88-94. Sadowsky SJ. 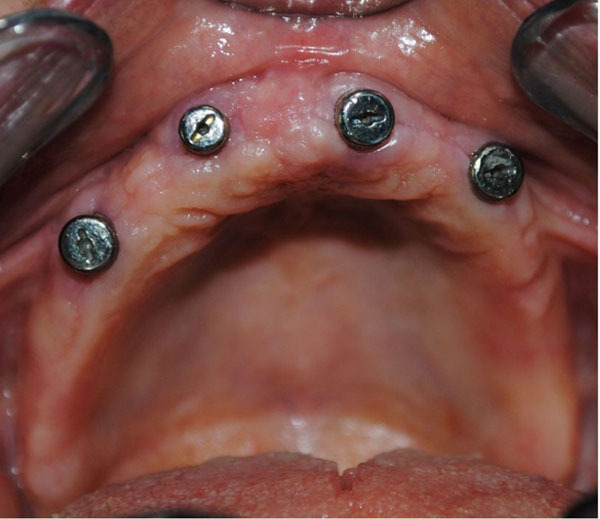 Treatment considerations for maxillary implant overdentures: A systematic review. J Prosthet Dent 2007; 97(6): 340-8. Hikita K, Uchiyama Y, Iiyama K, Duret F. Function and clinical application of dental CAD/CAM GN-1. Int J Comput Dent 2002; 5(1): 11-23. Raghoebar GM, Meijer HJ, Slot W, Slater JJ, Vissink A. A systematic review of implant-supported overdentures in the edentulous maxilla, compared to the mandible: How many implants? Eur J Oral Implantology 2014; 7(Suppl. 2): S191-201. 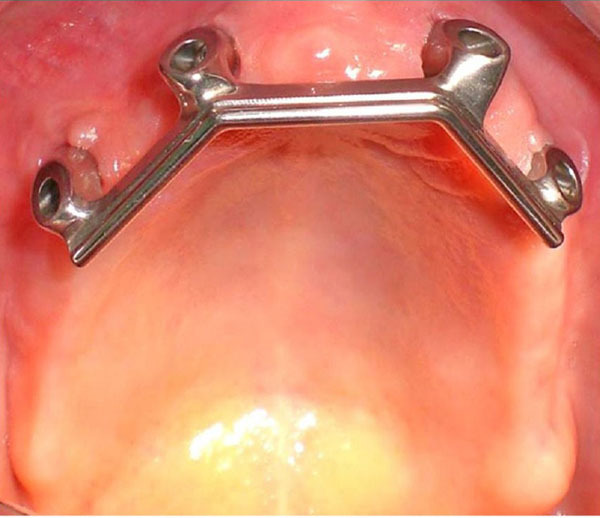 Meijer HJ, Raghoebar GM, Batenburg RH, Visser A, Vissink A. Mandibular overdentures supported by two or four endosseous implants: A 10-year clinical trial. Clin Oral Implants Res 2009; 20(7): 722-8. Corsalini M, Carella M, Boccaccio A, et al. An alternative approach to the polishing technique for acrylic resin surfaces. Int J Prosthodont 2008; 21(5): 409-12. Corsalini M, Rapone B, Grassi FR, Di Venere D. A study on oral rehabilitation in stroke patients: Analysis of a group of 33 patients. Gerodontology 2010; 27(3): 178-82. Corsalini M, Di Venere D, Pettini F, et al. A comparison of shear bond strength of ceramic and resin denture teeth on different acrylic resin bases. Open Dent J 2014; 8: 241-50. Abi Nader S, Eimar H, Momani M, Shang K, Daniel NG, Tamimi F. Plaque accumulation beneath maxillary all-on-4™ implant-supported prostheses. Clin Implant Dent Relat Res 2015; 17(5): 932-7. 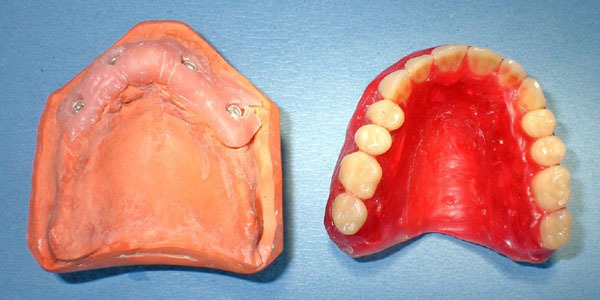 Zembic A, Wismeijer D. Patient-reported outcomes of maxillary implant-supported overdentures compared with conventional dentures. Clin Oral Implants Res 2014; 25(4): 441-50. Laforgia A, Corsalini M, Stefanachi G, Pettini F, Di Venere D. Assessment of psychopatologic traits in a group of patients with adult chronic periodontitis: Study on 108 cases and analysis of compliance during and after periodontal treatment. Int J Med Sci 2015; 12(10): 832-9. Ryniewicz AM, Bojko Ł, Ryniewicz WI. Microstructural and micromechanical tests of titanium biomaterials intended for prosthetic reconstructions. Acta Bioeng Biomech 2016; 18(1): 121-7. Waddell JN, Payne AG, Swain MV, Kieser JA. Scanning electron microscopy observations of failures of implant overdenture bars: A case series report. Clin Implant Dent Relat Res 2010; 12(1): 26-38.